“We see that every city is some sort of community, and that every community is constituted for the sake of some good, since everyone does everything for the sake of what seems good” (Politics, 1.1.1252a). Aristotle famously described humans as political animals. What he meant by that was that humans are, by their nature, social creatures. Community was a natural reflection of the desires of humans coming together to work for a common good in mutual cooperation with each other. Cicero, the great Roman statesman and philosopher, also concurs. A republic, Cicero claims, is “a numerous gathering brought together by legal consent and community of interest. The primary reason for this coming together is not so much weakness as a sort of innate desire on the part of human beings to form communities. For our species is not made up of solitary individuals” (Republic, 1.39-40). Not only was Cicero critiquing the unpatriotic and solitary attitudes of the Epicureans, he was equally criticizing all those who believed an unvirtuous people could sustain liberty without falling to demagoguery and tyranny. St. Thomas Aquinas is famously remembered as the theologian who baptized Aristotle into Christianity, much like how St. Augustine baptized Plato and Plotinus into Christianity. What is often forgotten, however, is the revived interest and influence that Cicero had over Thomas Aquinas’ writings. And following the Catholic tradition of viewing political community as an extension of paterfamilias, and that honoring one’s community is an extension of honoring one’s father and mother, Aquinas sets out an ambitious synthesis of a mixed political community that is both a natural extension of human habits and nature, but also helps to elucidate the practice of “moral excellence” that preoccupies both Aristotle and Cicero in their political philosophies through the inclusion of participation in civic order as a form of participatory theology. I must first begin by establishing a working definition of what I mean by “political theology.” By political theology, I am referring to the exercise of natural reason in conjuncture with divine revelation concerning the relationship between God, humanity, and world, and the proper ordering (tranquillitas ordinis) of the civitas terrena based upon the answers concerning that relationship. In this sense, I am neither referring to political theology as a politicized theology of command commissions communicated by Scripture to the faithful, nor the contemplation of (nor working toward) an idealized post-eschatological community to emerge at the end of history. Aquinas, then, agrees with Augustine that the city of God and city of man are intermixed together in the world, but unlike Augustine, the natural instinctiveness of humanity to form political communities, especially from among the faithful, should result in the promulgation and maintenance of arête once such a community forms. That Cicero should be influential over the thought of Thomas Aquinas should not be surprising. After all, Cicero was one of Augustine’s great interlocutors—both a teacher and foe, to the fifth-century bishop of Hippo. Augustine even credits Cicero and his call about the necessity to study philosophy as that which led him to begin to cultivate his own virtues, understand himself, and come to an understanding of God. Cicero, while being influenced by Greek philosophy, made important contributions to humanizing the Greek arts and modifying aspects of Greek political thought, drawing heavily from, but equally amending, the writings of Plato and Aristotle. The defense of political excellence, moral virtue, and patriotism by Cicero equally had an important influence upon the development of Christian political theory, especially in the ruminations of Thomas Aquinas who equally defends the Aristotelian-Ciceronian tradition of common good and common excellence as reflections of imago Dei and participation with the wisdom of God. At the beginning of The Republic Cicero states, “I simply state this basic fact: nature has given to mankind such a compulsion to do good, and such a desire to defend the well-being of community” (Republic, 1.1). Cicero is beginning with a critique of the Epicureans, and notes that moral excellence—as an individual—is somewhat pointless unless one “put it into practice” at a larger societal level (Republic, 1.2). The Epicurean withdrawal from society ultimately serves no end and certainly does not produce any level of virtue for the individual or of political society. While it can be understood that attaining arête, in any manner, is an accomplishment, to have achieved excellence in solitude defeats the communitarian instincts of human nature. The avenue of politics, then, is one of the mediums by which moral excellence can, and should, be practiced—for there are tremendous benefits wrought to the rest of society as a result. Cicero understands such public service to be a higher calling, “I did not hesitate to brave the wildest storms and almost the very thunderbolts to protect my countrymen” (Republic, 1.8) because such practical application of attained moral excellence is also a natural and instinctive desire within all humans “to do good and…defend the well-being of community.” To this end, Cato the Younger and Seneca also share the same political outlook of Cicero—the world of philosophy is intertwined with the world of the political and can come to help and improve the realm of the political. Cicero also believes that philosophy, which is the love of wisdom, is the natural handmaiden of politics and allows for the proper introspection of the self to know oneself and the natural order of the world in which humanity is situated (Laws, 1.58-63). Education in the humanities is a necessary endeavor by which moral excellence can be grounded and eventually applied to all aspects of one’s life. A lack of education leads to the corruption of the intellect which leads to intellectual folly, which then manifests itself in moral and community decay as “many people now, in their folly want to get rid of [an] admiral system” (Republic, 4.2). Cicero concludes that the decadence and downfall of any society rests within that society itself, “For it is not by some accident—no, it is because of our own moral failings—that we are left with the name of the Republic, having long since lost its substance” (Republic, 5.2). And this represents the collapse of arête in society. What should be evidently clear in the political thought of Cicero is that his understanding of moral excellence and political community is value-negative. That is, the attainment of arête through education, philosophical introspection, and the gradual practical application of moral excellence into politics (where the ideal statesman is like the farm-manager, a manager of justice, order, and security, rather than a “man of action” in the degraded form of politics), is something to be preserved and maintained at all costs. The loss of arête ultimately precipitates the degradation of society and whatever form of political order that that society has inherited (monarchy, aristocracy, or democracy), and all necessary measures to safeguard against this decline should be taken. Cicero, when pushed between choosing between monarchy, aristocracy, and democracy, opts for monarchy as the best of simple political forms. Cicero argues that monarchy is the most natural and reflective of human desires and instincts, “The name of king is like that of father, in that a king takes thought for his subjects as if they were his children… Accordingly, kings attract us by affection” (Republic, 1.54-55). The work of affectionate striving is one of the means by which virtue is inculcated in society. For Cicero, coming to the defense of one’s community—which is primarily the defense of the moral health of the community—is the highest expression of virtue (Republic 5.2). It is participatory in nature; the city calls its sons and daughters to defend it in its time of need. Those who answer, like in Aristotle’s Ethics, are those who have cultivated the virtue of the mean through knowledge leading to action. Cicero, then, agrees with Aristotle that “a city is excellent because the citizens who participate in the political system are excellent” (Politics, 7.13.1332a) because a morally excellent society, in Cicero’s political philosophy, leads to an excellent political community by which the good life (the happy life) becomes possible—but it is made possible only through the cultivation of maintenance of virtue because humans are creatures of action (cf. Republic, 5.7). The virtuous city is worth defending and participating in. Thomas Aquinas maintains that humans possess a telos, and that all human activity, however imperfect or impure, aims at that ultimate end. This extends to the nature of political community, which is the noblest and highest end to which any natural community can aim—since good politics and political order should yield a maximization of citizens in that community to be virtuous and therefore achieve the good life. As Aquinas states, “Man therefore needs something to guide him towards that end” (Political Writings, 1.1). This reflects that basic insight from the classical writers that humans are not solitary individuals, but social creatures who seek community—not for self-preservation and power (as Spinoza, Hobbes, and Locke had it), but “as a sort of innate desire on the part of human beings to form communities” as Aristotle and Cicero had it. In Aquinas, one simply does not excel in one’s personal vocation—although one should excel in one’s vocation—but one must also excel as a citizen of the republic which claims their earthly citizenship (Commentary on the Politics, 1.22-23). “Therefore,” writes Aquinas, “nature impels all human beings toward association. And the first one to institute the political community conferred the greatest benefits” (Commentary, 1.23). Following Augustine, Aquinas equally believes that, while Christians have eternal citizenship in heaven, the excellence they can come to possess on earth makes them better citizens for the civitas terrena. Like Cicero, Aquinas also believes that moral excellence, translated into politics, makes for political arête. Aquinas states unequivocally that through political and community association, “human beings reaching perfection are the best of all animals, so also human beings divorced from law and justice are the worst” (Commentary, 1.23). Political order, therefore, plays an indispensable role in cultivating arête and guiding humans toward their proper end (the cultivation of rationality by which the happy life becomes attainable through understanding the Cosmos and Natural Law established by God) in much the same vein as Cicero’s understanding of the purpose of political community. The foundations of Aquinas’ political theology rest upon a sort of emanation of the divine order down to the basic nature of life in the world. That the Cosmos is ordered and governed by Logos, so too is human society a reflection (albeit imperfect) of a similar ordering and governance that we call politics; political order can help (or abet) in the guidance towards an end. Just as Christian tradition from Augustine to the present affirms that participation with Logos brings forth excellence and the ascent to beauty, Aquinas maintains that ideal politics is also a participation with Logos that cultivates virtue and excellence in the citizenry and body politic. Concerning the nature of political order and guidance to a particular end, Aquinas states, “But where matters are directed towards some end, there may be one way of proceeding which is right and another which not right; and so we find that the government of a community can be directed both rightly and not rightly” (Political Writings, 1.2). Thus, political order has a necessary role in guiding people toward the attainment and self-promulgation of arête. In this, we see the nexus of Aquinas’ political theology. God rules and governs the Cosmos, which includes the earth. On earth, human societies reflect this divine ordering as an (initially) imperfect manifestation of the divine order through all forms of community: from the basic family to the complexities of the politeia. Humans occupy a middle-position between God and the rest of the animal kingdom, and it is through human rationality that humans can move closer in imitation and participation with the divine order (an extension of the imago Dei and participatio Trinitatis), or lax into the more basic and instinctive nature of the animal world, thereby becoming brute animals (a theme shared by other classical theorists like Aristotle and Cicero). Aquinas, then, believes that the formation of communities is not only natural but that community brings about a greater good and welfare for all participants in said community. “Now since it is fitting for man to live in a community because he would not be able to provide all the necessaries of life for himself were he to remain alone, it must be that a society of many men will be perfect to the extent that it is self-sufficient in the necessaries of life” (Political Writings, 1.2). What is important to note is how Aquinas states “that a society of many men will be perfect,” implying, of course, that a perfect community can be achieved (through a heightened participation in the divine ordering). The promulgation of arête, made possible in political order and community, helps to lead to a greater perfection of human society as a reflection of participatio Trinitatis. Indeed, the attainment of arête is the result of this participation in (and with) the Trinity. The participation therein, much like how Cicero’s person seeks to be one with Natural Law (cf. Laws, 1.16-35) implies a value-negative society whereby it is right and proper to safeguard such excellence against whatever forces work toward the opposite. The codification of positive law, as a reflection of the Natural Law, is one of many means by which this is to be prevented, which also aids in the moral excellence of a society. Thus, as humanity is called to excellence by being a reflection of the imago Dei, political community is called to excellence by a henosis, through participation, with the divine ordering of the Cosmos that seeps down to every aspect of life: self, family, town, and politeia. Taken as a whole, this represents the fullness of political community. Insofar that Aquinas prefers the rule of one (cf. Political Writings, 1.3-4), which was Cicero’s definition of a commonwealth ruled over by a monarch, this reflects Aquinas’ political theology, in conjuncture with natural reason, in much the same way that Cicero understood monarchy (in its best form, giving the example of Cyrus of Persia), as reflecting and engendering the very natural instincts and observations we all know: affection, order, and justice as represented by the paterfamilias who is the king (refer back to The Republic, 1.54-55). Aquinas’ defense of monarchy is not made out of national fidelity to the national kingdom in-of-itself (as if some form of primordial nationalism, which it is not). It is made in an understanding of the order of the world, and the nature of political order which yields the optimal benefits to societal community. Aquinas would agree with Cicero that “there is no greater blessing than a well-ordered state” (Republic, 5.7) which the rule of one best reflects in comparison to alternative forms of government. He also notes the instinctive and important nature of political order, “But the good and wellbeing of a community united in fellowship lies in the preservation of its unity. This is called peace” (Political Writings, 1.3). It is important to note, here, that Aquinas also agrees with Augustine that peace is the instinctive desire of all creatures. Unitary rule, then, unites human society like a family to father and mother (represented by king and church respectively). There is, naturality in both affection to the monarch and promulgation of arête through the order and beauty that monarchy represents and engenders in its optimal form. That affectionate unity in society, from Aquinas’s perspective, is one of the more important—if otherwise esoteric—reasons for his promotion of monarchy (which is reminiscent of Cicero’s argument). Insofar that alternative governmental forms, aristocracy or democracy, necessitate division and separation, such political forms may fall prey to a greater tendency not only to division and disorder, but also tyranny (cf. Political Writings, 1.6). Aquinas notes that while monarchy is by no means perfect, the corrupt monarchy corrupts the monarch and that such corruption is easier quarantined than the corruption of ruling councils or elected officials, by which corrupt aristocracies (oligarchies) and constitutional orders (democracies) may infect society-at-large therefore upending the arête of political community in the process by polluting the common good; he aptly summarizes this by writing, “one should certainly choose that which is accompanied by the lesser danger. But if monarchy is changed into tyranny, less evil flows from this than when the government of a number of the best men becomes corrupt” (Political Writings, 1.6). Again, we see in Aquinas’ political theology aversion toward the value-negative aspect of political community; therefore, the political order that best guards against this potential corruption and negativity is to be preferred. 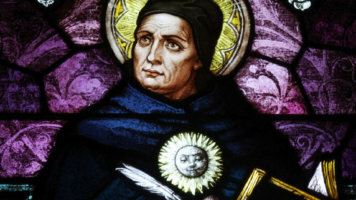 From this, moral excellence—arête—is also achieved and maintained by the political community which is a fundamentally good thing, and from which all persons in society benefit from in their participation of arête (which, again, is a form of participatio Trinitatis in Aquinas’ political thought). The fundamental difference between Cicero and Aquinas is that Aquinas’ virtuous city has a theological element to it, whereas Cicero’s is purely rooted in the civitas terrena. This is not to say, as with Cicero, that Aquinas only endorses monarchy. Cicero, after all, was a famous defender of the Roman Republic to its death—and he was clear on his preference for a mixed constitution. However, both Cicero and Aquinas reflect upon how monarchy is the closest reflection of emanated order and how all facets of society playing their role lead—not only to what Aristotle called practical wisdom in life (phronesis)—but demands the cultivation of virtue in of itself. That is to say that both see the political, in whatever form it takes, calling its citizenry to cultivate virtue and defend the health and vitality of the political community—however imperfect it is. It is true that Thomas Aquinas owes much to Aristotle, and it is equally true that Cicero integrated Greek philosophy into Latin culture and owed much to Plato and Aristotle. Despite their dissimilarities, which are glaringly evident, all three share much in common. However, that Ciceronian politics was dealt with unsympathetically by Augustine in The City of God resulted in an Augustinian political theology less concerned with positivism and the attainment of arête in political community than a community united in love (cf. City of God, 19.24) and restless pilgrimage for beauty and solace offered only in God. While Aquinas would have considered himself a disciple of Augustine, his treatment of politics helped to rehabilitate Cicero’s political philosophy. Whereas Augustine sees political order as temporal, and worthy only insofar as it provides imperfect and temporary modicums of peace, security, and order (but even such imperfect orders are, in fact, worth defending), Augustine does not share with Cicero, or Aquinas, the notion of political arête (even if Aquinas equally would agree that all political order is temporal and imperfect). Political order allows humans to pursue their loves: cupiditas or caritas, but ultimately cannot guide humans toward the most sublime and desirable end in Augustine’s outlook. The unfolding of libido dominandi and the outplaying of the two loves remain in conflict except in “that republic whose founder and ruler is Christ” (City of God, 2.22). While Augustine’s realism concerning a politics of non-harm and compromise (City of God, 19.14) are worthwhile, the general concern with politics and philosophy as handmaidens of virtue in Cicero and Aquinas would go hand-in-hand with Augustine’s political realism. Thomas Aquinas, then, seems to share much more in common with Cicero and helped rehabilitate the Ciceronian ideal of politics and the belief that political community can help foster, and maintain, arête. While Augustine should never be lost for his many contributions to political theory, neither should Cicero or Thomas Aquinas—in fact, they should be blended together where compromise and non-harm find sustenance through political virtue itself. In fact, we would do wise to rediscover Cicero and Aquinas going forward. Virtue is what the good city aims to achieve as part of the common good. Since humans are social animals and creatures of actions, the call to cultivate virtue within civil society is a fundamental aspect of the good society and the good regime. This essay was originally published with the same title at The Imaginative Conservative on October 26, 2017.